The Killing Season is a brisk and efficient thriller. 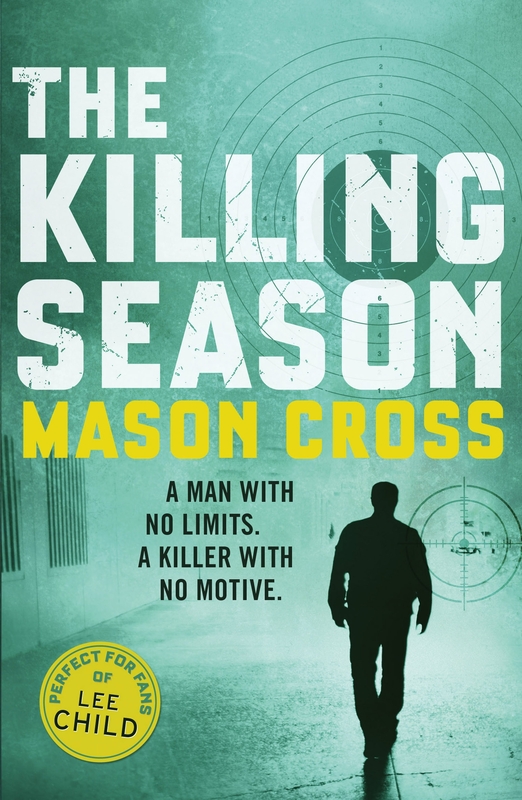 Mason Cross’s debut pits Blake and his temporary FBI allies against the infamous “Chicago Sniper,” Caleb Wardell, who escaped confinement during a seemingly unrelated jailbreak. Mere hours after being inadvertently freed, Wardell takes up his old hobby: merrily blasting away innocent bystanders. How can Blake track a killer without a cause? And how will he respond when he learns he could’ve put a bullet in Wardell’s brain long before his killing sprees? There’s a definite Jack Reacher vibe to Carter Blake, who plays the role of the mysterious stranger who arrives in town to solve a specific problem, bedding a beautiful woman long the way, and busting plenty of noses. Blake’s past is barely touched in The Killing Season; no doubt territory that’ll be explored, and sporadically dipped into, in future installments. This novel’s duty is to ensure that’s a readership awaiting that disclosure, and in that respect it succeeds. While there’s nothing innovative on display, The Killing Season is finely crafted with a confidence that rarely radiates from debuts. It’s soundly constructed, and moves quickly, with plenty of action, and a deep-lying conspiracy that propels the novel above the genre’s riff-raff. The novel flounders when it clasps onto the tropes thriller readers are so accustomed to. Elaine Banner is a strong, capable female character; it’s a shame the author makes the decision to have her sleep with Blake, even though there’s never any suggestion it’s anything more than a one-night thing. I’m all for an underlying sexual tension between leads, but it always rings false after a mere 300 pages, no matter who your protagonist is. The action, too, while soundly executed, is derivative of scenarios we’ve all read before: the rushed escape from a burning building; a brutal punch-out; a chase through the woods. It’s all adrenaline-fuelled, and it’s undoubtedly page-turning; there’s just not enough to make it stand out from the pack. The Killing Season is a solid thriller. Certainly enjoyable, and Carter Blake shows promise as a protagonist who could possibly helm a long-running series. But what’s that special something that’s going to separate Blake from Reacher, or Mason Cross from Lee Child? I hope we find out in The Samaritan.